GreenCircle Certified, LLC will verify and certify claims that life cycle impacts of products and processes were reduced as a result of using LCA data. 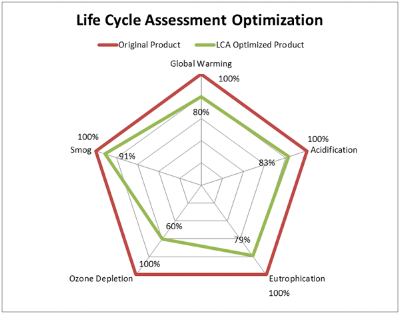 GreenCircle will validate the reduction in environmental impacts of a product by comparing a baseline LCA to the LCA of the optimized product. Objective: To validate the reduction of environmental impacts of a product based on changes to the product after a baseline LCA was completed. Definitions: Utilizing Life Cycle Assessment data, which reflects the environmental impact of a given product or service throughout its life span (raw material extraction through end of life), GreenCircle will quantify reductions in environmental impacts. Reference Documents: ASTM 1991-05 Standard Guide for Environmental Life Cycle Assessment of Building Materials/Products; ISO 14040 Environmental Management Life Cycle Assessment Principles and Framework; ISO 14044 Environmental Management of Life Cycle Assessment Requirements and Guidelines.